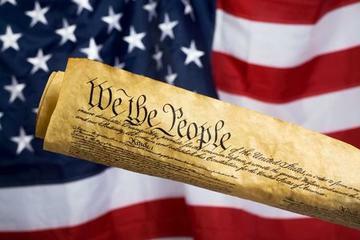 The first ten amendments to the U.S. Constitution make up what is known as the Bill of Rights. These amendments form part of the essence of what makes United States citizenship the privilege that it is. Many people are familiar with freedom of speech, freedom of religion, and freedom of the press, but these important Constitutional amendments offer more than those rights, as the following summary demonstrates. Congress cannot make a law that favors the establishment of one particular religion; that prohibits the free exercise of religion; or that restricts freedom of speech or of the press, or the right of the people to gather and engage in peaceful demonstrations and to petition the government for redress of their grievances. Because a well-regulated militia is necessary to national security, the right of the people to keep and bear arms may not be infringed. No soldier may be quartered in any house during a time of peace without the owner's consent, or in a time of war except as prescribed by law. People have the right to be free, in their persons, houses, papers, and effects, from unreasonable searches and seizures, and no warrants may issue without probable cause, supported by oath or affirmation, and specifically describing the place to be searched and the persons or things to be seized. No person may be tried for a capital or other "infamous crime" unless he or she has first been indicted by a grand jury, except in military cases. No person may be made to answer for the same offense twice (double jeopardy); be compelled to be a witness against himself or herself in a criminal case; or be deprived of life, liberty, or property without due process of law. Nor may private property be taken for public use without fair compensation (eminent domain). Whenever someone is on trial for committing a crime, he or she has the right to a speedy and public trial by an impartial jury of the state and district where the crime was committed, to be informed of the nature and cause of the accusation, to confront the witnesses against him or her, to be able to compel the testimony of witnesses in his or her favor, and to the assistance of defense counsel. Whenever the amount at issue in a lawsuit is over twenty dollars, the parties have the right to a jury trial, and no jury verdict may be overturned except according to the strict rules of the justice system. There can be no excessive bail or fines, nor cruel and unusual punishment. This list of rights should not be read to limit in any way any other rights of the people. The powers not specifically granted to the federal government by the Constitution, nor prohibited by the Constitution to the states, are reserved to the states respectively, or to the people. Note: The following text is a transcription of the Constitution as it was inscribed by Jacob Shallus on parchment (the document on display in the Rotunda at the National Archives Museum.) Items that are hyperlinked have since been amended or superseded.